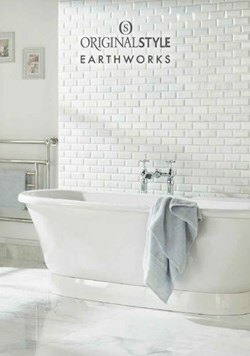 If you’re looking to embrace the classic beauty of natural stone, then the Earthworks Autumn Collection from Original Style is a great place to start. This quality selection of natural stone tiles for walls and floors celebrates the versatility of stone with a myriad of shades and formats, each paired with the perfect finish to bring out its best. Whether formed of marble, travertine, slate or limestone, the inherent features of mottling and veining make each tile charmingly unique. Then it is finished with a polished, brushed, honed or tumbled surface to shape it into something truly elegant. Please contact us on 01425 621173 to place your order or to enquire about any of the Original Style ranges.